Nettie Kroeker: educator and writer, was born 26 November 1900 in Winkler, Manitoba, Canada. Her parents were Abraham Kroeker (1854-1906) and Helena Wiens Kroeker (1856-1946). Her grandparents were Kornelius Kroeker (1819-? ), and Katarina Andres (1814-? ), and Jacob Wiens (1816-1888) and Katharina Klassen (1817-1884). She was the youngest 11 children, six of whom survived infancy. Kroeker did not marry; she died in Winnipeg, Manitoba on 24 February 1989. Nettie Kroeker lived in the Winkler, Manitoba area until the 1950s. For the remainder of her life she lived in Winnipeg. She attended elementary school in Blumstein and high school in Winkler. She attended the provincial Normal School in Manitou and Winnipeg. She was a student and then teacher in Winkler Bible School from 1917-1930, and again 1934-1935. In 1942, after her mother became a widow for the second time, Nettie cared for her mother until her mother’s death in 1946. She then continued her education, attaining a Bachelor of Religious Education (B.R.E.) at Mennonite Brethren Bible College in 1948 in Winnipeg, and and a Master of Religious Education (M.R.E.) at Southwestern Baptist Theological Seminary, Fort Worth, Texas. She then served as Associate Editor of the Mennonite Brethren Sunday School Instructor, lectured on Christian education, and conducted workshops at various venues and institutions. She resumed teaching as a kindergarten teacher (1962-1968) in the Winnipeg public system. After retiring, she enrolled in the writer’s correspondence courses. She spent her remaining years as a writer. 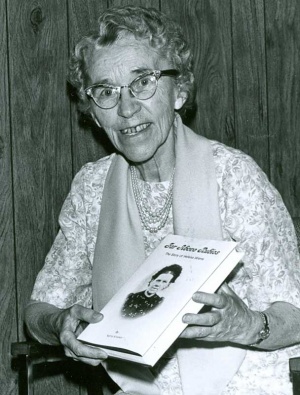 Kroeker wrote a biographical novel about her mother, Helena Wiens, 1856-1946 (Far Above Rubies, 1976) and biographical sketches of various Mennonite leaders in They Left Their Mark, 1979. Included was Anna Thiessen (1892-1977), Jacob Kroeker (1878-1945), Abram Kroeker (1892-1981), John B. Dyck (1874-1937), Anne Ediger (1920-1981), and Helen Warkentin (1887-1975). Kroeker was an influence to her family’s many descendants and through her congregational and conference affiliations. Mennonitische Rundschau (29 March 1989): 25. Friesen, Bert. "Kroeker, Aganetha "Nettie" (1900-1989)." Global Anabaptist Mennonite Encyclopedia Online. October 2009. Web. 23 Apr 2019. http://gameo.org/index.php?title=Kroeker,_Aganetha_%22Nettie%22_(1900-1989)&oldid=143077. Friesen, Bert. (October 2009). Kroeker, Aganetha "Nettie" (1900-1989). Global Anabaptist Mennonite Encyclopedia Online. Retrieved 23 April 2019, from http://gameo.org/index.php?title=Kroeker,_Aganetha_%22Nettie%22_(1900-1989)&oldid=143077.